How Many Calories Are In a Baked Potato with Cheese? A baked potato smothered with melted cheese ranks high on the list of comfort foods. While this side dish can certainly rack up the calories, there are ways to make your spud healthy. 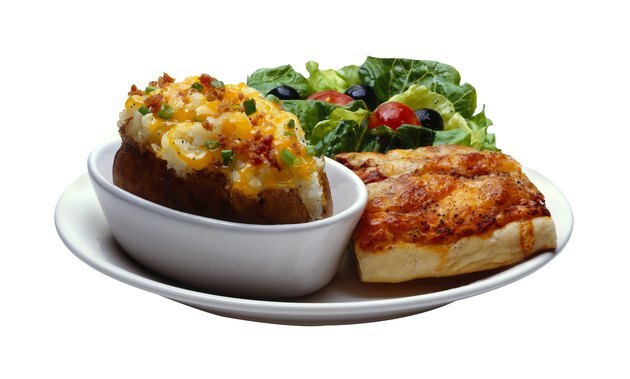 Opt for low-fat cheese and eat the whole potato -- skin and all -- to get the maximum amount of dietary fiber. There is some variance in calorie count between different types of potatoes. A medium white potato -- one that's 2 1/4 to 3 1/4 inches in diameter -- has 163 calories, while a russet potato of the same size has 168 calories. A medium red potato has only 154 calories. A common potato topping is shredded cheddar cheese. One ounce of full-fat cheddar packs 114 calories, while the same serving size of low-fat cheese has only 49 calories. Cheese sauce will cost you 59 calories for a 2-tablespoon serving. Probably the healthiest option is nonfat cottage cheese, which has only 104 calories in a 1-cup serving.